The long awaited feature is finally here! 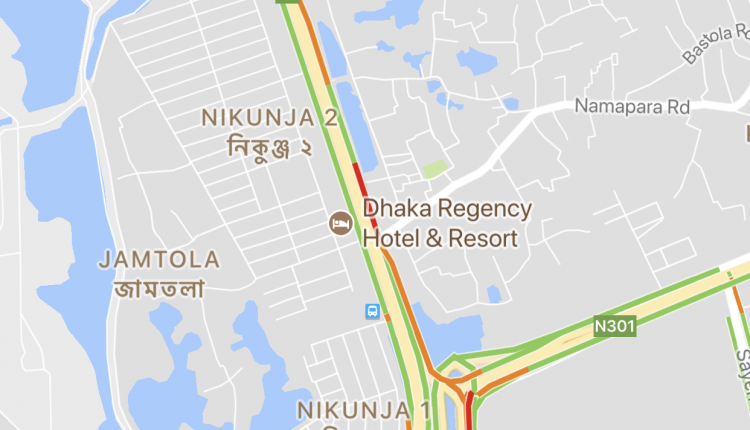 One of the greatest features of Google Maps is the real-time traffic update which us, the Bangladeshis, was deprived off until today. Whenever I switch on the Maps app to find a location, I so wished to see the real time traffic updates. Finally, Google has enabled this feature for us here. 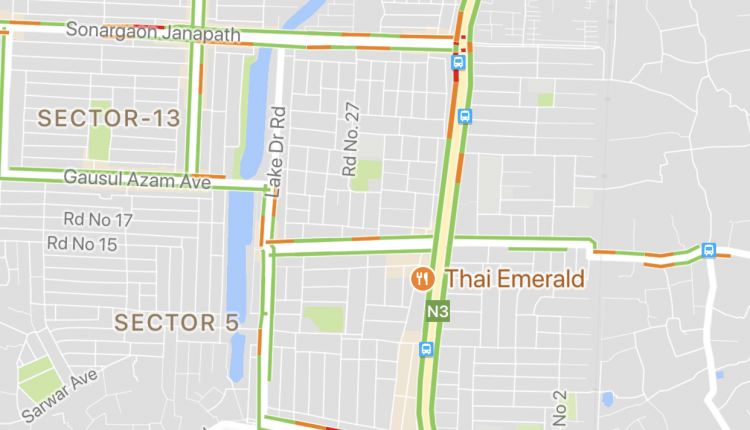 I always have the traffic mode enabled and today when I went to check randomly, I was surprised to see color lines on the roads depicting the traffic condition. 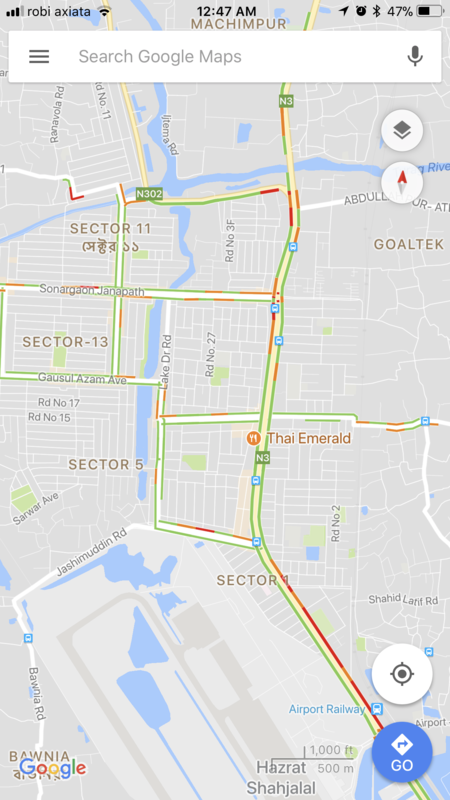 Red being the a traffic congestion and green being the free road. The accuracy of the traffic was quite accurate. 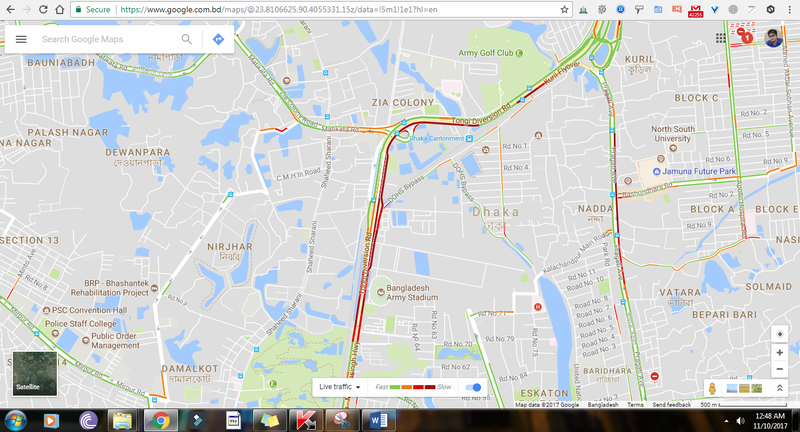 I am writing this article at 12:30 AM at night and this is traffic condition I am seeing in Google Maps right now. You might be wondering why are there red lines near army stadium? Simple, due to International Folkfest festival. Cars are parked randomly in places causing the incoming traffic to slow down. How does Google get the data in details? Well, every time you use the Maps app, you allow it to access your location. The app send the data back to its server and in that way, if the location is on a road, Google will be able to analyze in real-time whether you’re moving or stuck in one place. By taking in data from millions of users 24/7, Google is able to predict where and when you can get heavy traffic. However, if you do not want Google to access your location and invade your privacy, you always have the option to switch it off but do remember you are doing it and everyone else does the same, the traffic update would become pointless. In the desktop maps, you will have two options to view: Typical Traffic Mode or Live Traffic. Live traffic is simply the condition of traffic in real time and Typical Traffic mode is more of an historical data based on the days and time. The real time traffic update will definitely help us in making better decisions in moving ahead but for that, the more users we have with location tracking on, the better. 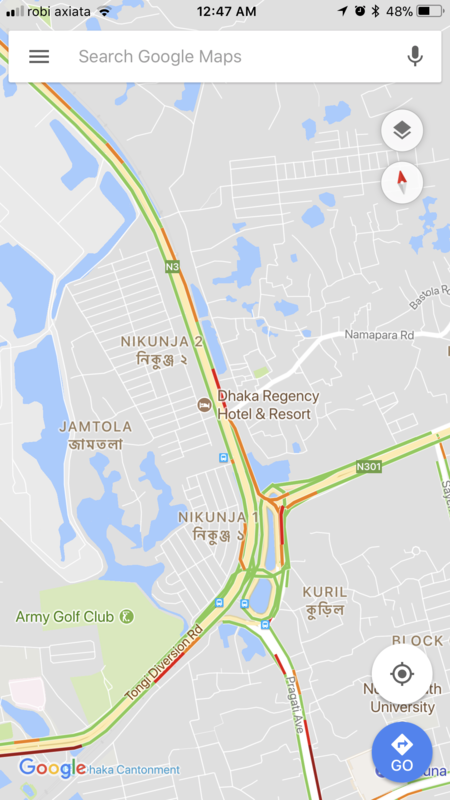 Thanks to Google for introducing this splendid feature here in Bangladesh!